Basically it allows you to control the the velocity pan and delay values of notes already in a track from the automaton editor. Either the selected column or all columns in the pattern_track can be chosen. (You will need to navigate to the VEL, PAN or DLY automation which should be enabled) and you are then presented with what is shown in the following screen shots. While the tool is running the Control Panel GUI stays open, this has been done as like I say the tool is a bit hacky and the control panel gives you confirmation it is enabled plus some features to work with it. Refreshes the envelope manually after you have been changing things in the pattern editor. This will also bee done automatically every time you change column or track in the pattern editor, but this is there for the occasions you may need it. Will apply the current velocity envelope to all columns when active, Also applies the Set All In Col slider to all columns. Note when using the automation with this enabled, only the lines with notes on are copied whereas with the Set All In Col slider every note in the pattern_track gets effected. Closer X, worth mentioning as when GUI is closed, all added devices and envelopes are removed and the tool is de-activated. Using the toggle short-cut to close has the same effect. Once the tool is enabled you will see the Vel Pan Dly device appear at the first position in the track DSPs, this is how the envelopes are created. You will need to navigate to the VEL automation which should be enabled. Now you can effect the notes in your track from this automation. 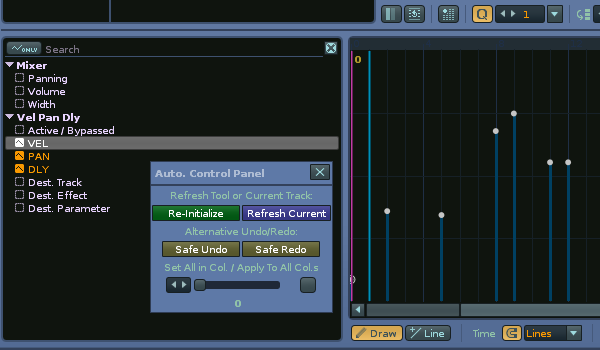 As you change to each track you will have to navigate to the VEL parameter for the first time you are on that track. Unfortunately there is no way for the script to do this automatically though I have asked for the feature in the API thread, because of this. Shortcuts for some of the Control panel functions available also, just search for `VPD` in the renoise shortcuts list . v0.57 - bug fixes for issues when changing patterns or adding a new track could crash the running tool. Velocity automation curve: script integration? Automation of velocity: How to easily automate? Finding it really useful already here already, the inspiration came after watching some Timothy Allan groove3 videos where he shows how important little volume and delay offsets can make a huge difference to the sound of a beat. Not quite so easy/ comfortable in renoise without these envelopes which most piano rolls have as standard. thanks for testing, keep me updated. Not quite so easy/ comfortable in renoise without these envelopes which most piano rolls have as standard. But with panning or volume, this technique wouldn’t be optimal - the Pxx (Pan) and Lxx (Level) commands would affect a sound through it’s playback, and not just from the onset. Handy tip! thanks. I remember doing something similar sometimes before renoise changed from simple tick timing. The trouble being it had to be global back then. repeating on a beat at 120bpm, 12ticks per line , 4lpb and it adds a nice instant swing. However the delays I am talking about are not just about swing or groove applied as a template in this way. In the Ableton vids I saw , it was about nudging notes here and there by fractions before and after the quantized timeline, doing it by ear to get the various hits / elements gelling together. This going hand in hand with modifying ADSR envelopes and note lengths at tiny values too. Admittedly in the PR these nudges are done by hand directly, but in renoise it needs to be done by pattern commands currently. The velocity envelopes are the other PR tool in the arsenal aswell. If you’re intrested to see the vids I’m taking about there is a free 30 day promotion for the site (not sure if it`s still valid but might be worth a shot). I’ve thought about making a similar tool, but for any effect value (probably stored in the dsp title). Any chance you will expand this to a more general dsp like that? PS. Portamendos and volume slides could be interpreted as the envelope curve, instead of just pasting the values. Special cases for arp and vibrato effects might also be fitting. Maybe stuff like this will appear as the tool progresses, just want to get things as reliable as possible first. Ledger, nice tool would be! It is not really clear that drawing automation only works when track has some notes and that tool operates only on available notes which mean you can’t add automation where no notes present. Other than that - make is a DSP device and everything is cool. Thanks, I`ll make sure I make that a bit clearer in the description. I was going to suggest you put this in the ideas and suggestions forum, but see you already have. Agree it would be great to have a renoise implementation of this. -bug fixes for issues when changing patterns or adding a new track could crash the running tool. works flawlessly - many thx for that ledger! I was thinking about this tool, and I had an idea how to have some basic piano roll features in renoise via automation envelopes. Automation points could be used for editing the Note On and Off positions of a note column. If we use the MIDI instrument control device as the automation source, we could even give human readable names to the automation (column 1,2,3) (since the displayed parameter is 0-127). We’d get zooming (don’t forget, it’s pattern-consistent), an overview of the track and pattern_track, high precision click and drag, and a simple high-precision connection of automation to note starts/ends - with a simple copy-paste. The tool could adjust the values of the parameters in the automation too, so that you wouldn’t change the pitch by accident if you don’t want to. Maybe in the future we might also get vertical lock for the automation envelopes as well, and the cursor positions and selection via the API - to scroll the pattern accordingly, and have a loop selections function. To be honest it’s not something I’d be inclined to do myself but please do hack away/ borrow from my tool if you like; though I can’t remember how tidy the code is for this one. If piano roll (alternative note view) type features are going to only come about by scripters in renoise, my main hope would be for some sort of more advanced graphics framework to be incorperated with Lua. I`m sure people could come up with all sorts of notation/drum/harmonic interfaces. Reminds me that someone posted a framework to integrate internet browsers for more graphical stuff. I don`t know if anything has been done with that yet though? No, not yet, no use of that AJAX connection. And definitely not writing that tool anytime soon as well, haha, but I thought it fit the topic of the thread. I`ll have to look at the AJAX connection thing again sometime myself too.